I recently had a chance to play with the PiCube, a 3D grid of 64 LEDs that you can control using the Raspberry Pi's 40 GPIO pins. It's a clever design based on multiplexing that makes this possible, but the compromise is that you can't individually control each light. All the layers that are switched on show the same lights. It's of limited use for games, then, but could be great for creating visual effects. If you're building a large robot, you could make its pulsing "heart" using PiCube (although not in a heart shape). I'm reminded of KITT's voice box in Knight Rider. In education, it provides a highly visual way to explore nested loops and nested lists. It's also a good way to drill your soldering skills, since it comes in kit form. You can read my review of it in issue 67 of The MagPi, which has just been published. It's available for free download, but you can support the Raspberry Pi Foundation by buying it, on the high street or by subscription. And here's the code I wrote for that demo. PiCube comes with some demo programs, but the pin numbers were arranged in a linear list in them. I found it easier to work my way around the grid when I created a nested list for the pins, which I've called GRID_3D here. PiCube is available now from SB Components. Cool Scratch Projects gets a cool 5* review! 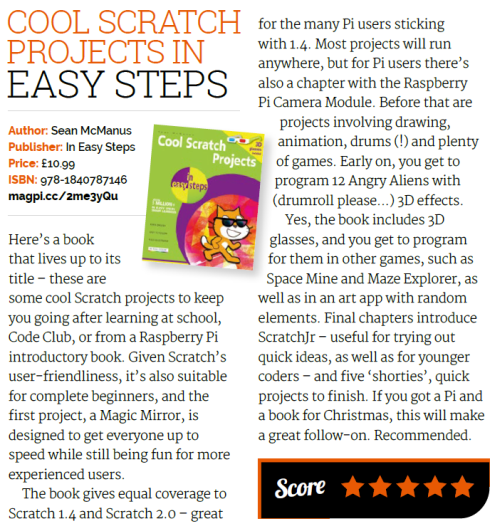 My book Cool Scratch Projects In Easy Steps has received a fantastic 5* review in the latest issue of The MagPi magazine! The reviewer loved that some of the games are programmed in 3D, and that each book comes with its own pair of 3D glasses and has an easy first project so you can get stuck in straight away. You can read the review for yourself below and in issue 66 of The MagPi, available to download for free from The MagPi website. Alternatively, why not support the Raspberry Pi Foundation by subscribing to the print edition, or picking a copy up from your local newsagent or bookstore? Cool Scratch Projects in Easy Steps is out now. Find out more and download a free PDF sampler here, which includes the Magic Mirror project mentioned in the review. You can also watch a video previewing all the projects below. Many thanks to The MagPi for the review!